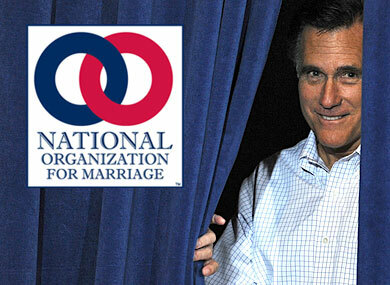 Mitt Romney has not only signed a pledge from the National Organization for marriage to fight for an amendment to the U.S. Constitution, he's also given money to the antigay group's efforts, according to a document circulated by the Human Rights Campaign. HRC posted a copy of a Federal Election Commission filing from the Alabama-based Free and Strong America PAC, run by the Romney presidential campaign in 2008. It shows a $10,000 donation to NOM that could be the very same contribution that a campaign spokesman once bragged would help fund the Proposition 8 battle that was happening at the time. The Huffington Post reports that Romney spokesman Eric Fehrnstrom told Salt Lake City's Deseret News in October 2008, "The governor feels strongly that marriage is an institution between a man and a woman, and one of the most high-profile fights on this subject is happening in California." He revealed that Romney had made a $10,000 donation, but until now there hasn't been any docmentation to confirm it — that is, if it's the same donation. As a donor and presumably a member of NOM, since a portion of all donations automatically goes toward membership dues, it's possible that the Romney campaign saw the "confidential" memo in which NOM outlines its strategy to "drive a wedge between gays and blacks — two key Democratic constituencies." HRC and others are calling on Romney to denounce NOM. But as a 2012 candidate he's signed a pledge from the group that commits him to its ideals, including a ban on marriage equality via an amendment to the U.S. Constitution, an effort to repeal marriage equality in Washington, D.C., and the formation of a presidential commission to investigate NOM's opponents. "The evidence continues to pile up and is painting a very clear picture of Mitt Romney’s anti-LGBT associations," the HRC said in announcing the document. "A candidate can’t claim to be 'better for gay rights than [Ted] Kennedy' when it’s convenient, but then fund a far-right anti-LGBT strategy to keep other interest groups happy."